Masazumi Chaya was born in Fukuoka, Japan, where he began his classical ballet training. Upon moving to New York in December 1970, he studied modern dance and performed with the Richard Englund Repertory Company. Mr. Chaya joined Alvin Ailey American Dance Theater in 1972 and performed with the Company for 15 years. In 1988, he became the Company’s Rehearsal Director after serving as Assistant Rehearsal Director for two years. A master teacher, both on tour with the Company and in his native Japan, he served as choreographic assistant to Alvin Ailey and John Butler. In 1991, Mr. Chaya was named Associate Artistic Director of the Company. He continues to provide invaluable creative assistance in all facets of its operations. In 2002, Mr. Chaya coordinated the Company’s appearance at the Rockefeller Center Christmas tree-lighting ceremony, broadcast on NBC. Mr. Chaya has restaged numerous ballets, including Alvin Ailey’s Flowers for the State Ballet of Missouri (1990) and The River for the Royal Swedish Ballet (1993), Ballet Florida (1995), National Ballet of Prague (1995), Pennsylvania Ballet (1996) and Colorado Ballet (1998). He has also restaged The Mooche, The Stack-Up, Episodes, Bad Blood, Hidden Rites, Urban Folk Dance, and Witness for the Company. At the beginning of his tenure as Associate Artistic Director, Mr. Chaya restaged Ailey’s For ‘Bird’ - With Love for a Dance in America program entitled Alvin Ailey American Dance Theater: Steps Ahead. In 2000, he restaged Ailey’s Night Creature for the Rome Opera House and The River for La Scala Ballet. In 2003, he restaged The River for North Carolina Dance Theatre and for Julio Bocca’s Ballet Argentina. Most recently, Mr. Chaya restaged Blues Suite, Mary Lou’s Mass, Three Black Kings, Forgotten Time, Hymn, and Streams for the Company. As a performer, Mr. Chaya appeared on Japanese television in both dramatic and musical productions. He wishes to recognize the artistic contribution and spirit of his late friend and fellow artist, Michihiko Oka. Masazumi Chaya was born in Fukuoka, Japan, where he began his classical ballet training. Upon moving to New York in December 1970, he studied modern dance and performed with the Richard Englund Repertory Company. Mr. Chaya joined Alvin Ailey American Dance Theater in 1972 and performed with the Company for 15 years. In 1988, he became the Company's Rehearsal Director after serving as Assistant Rehearsal Director for two years. A master teacher, both on tour with the Company and in his native Japan, he served as choreographic assistant to Alvin Ailey and John Butler. In 1991, Mr. Chaya was named Associate Artistic Director of the Company. He continues to provide invaluable creative assistance in all facets of its operations. In 2002, Mr. Chaya coordinated the Company’s appearance at the Rockefeller Center Christmas tree-lighting ceremony, broadcast on NBC. Mr. Chaya has restaged numerous ballets, including Alvin Ailey's Flowers for the State Ballet of Missouri (1990) and The River for the Royal Swedish Ballet (1993), Ballet Florida (1995), National Ballet of Prague (1995), Pennsylvania Ballet (1996), and Colorado Ballet (1998). He has also restaged The Mooche, The Stack-Up, Episodes, Bad Blood, Hidden Rites, and Witness for the Company. At the beginning of his tenure as Associate Artistic Director, Mr. Chaya restaged Ailey's For ‘Bird’ - With Love for a “Dance in America” program entitled Alvin Ailey American Dance Theater: Steps Ahead. In 2000, he restaged Ailey’s Night Creature for the Rome Opera House and The River for La Scala Ballet. In 2003, he restaged The River for North Carolina Dance Theatre and for Julio Bocca’s Ballet Argentina. Most recently, Mr. Chaya restaged Blues Suite, Forgotten Time, Streams, Urban Folk Dance, and Vespers for the Company. As a performer, Mr. Chaya appeared on Japanese television in both dramatic and musical productions. He wishes to recognize the artistic contribution and spirit of his late friend and fellow artist, Michihiko Oka. 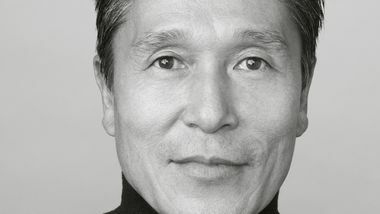 The voice on the phone belonged to Masazumi Chaya, the associate artistic director of Alvin Ailey American Dance Theater, and he had a startling proposition. Would she - Elizabeth Roxas-Dobrish, 55 years old, former Ailey superstar and current artificial-hip owner - come out of retirement to dance at a special performance on New Year's Eve?